Seoul Semiconductor (SSC), the leading provider of various LED packages, has introduced the two new Z-POWER LED series: the P9 0.5W emitter and the P3 side emitter. In today's market, there have been only 2 categories of LEDs; (1) high brightness and high cost, and (2) low brightness and low cost. The P9 was designed to fill the gap between those two categories by providing a cost effective, optimal brightness LED source. The P9 is designed exactly to meet customer needs. The P9 series appeals to customers requiring products where cost and power consumption are much less than 1W power LEDs, and where brightness exceeds any conventional lamp LEDs. 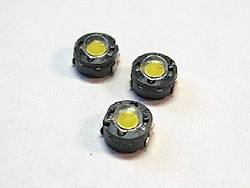 Also, the P9 series is reflow solderable while other lamp LEDs are not available for SMD. The P9 series has two kinds of built-in optics: narrow beam, which is good for torch applications, and wide beam, which is good for channel lighting. This is compatible with secondary optic suppliers (It's available for various viewing angles of collimators). So, it can make various styles of lighting with the lenses of different viewing angles. P3 side emitter with wide viewing angle SSC has unveiled another new product, the P3 side emitter optimized for channel lighting, which has a wide viewing angle, enough to eliminate the white spot problem. It is thinner than other companies' counterpart products. Therefore, it's easy to install to the low-high channel lighting application. It can be also applied to back lighting for sign board, and wall lighting.